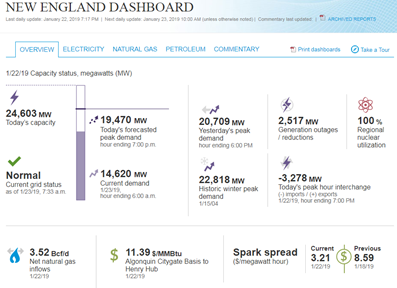 To increase customer understanding of weather-related energy issues in New England, EIA now has an interactive dashboard showing energy market conditions in that region. 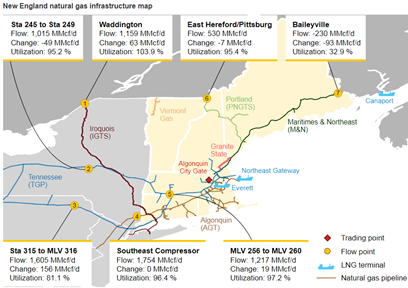 EIA will update the New England Dashboard every day by 10:30 a.m. Eastern Standard Time, including on weekends. The dashboard includes detailed regional information on temperatures; various fuel prices; locational marginal prices; the status of the electric grid, outages, and available capacity; current and projected load; liquefied natural gas (LNG) imports; electricity generation fuel mix; inter-regional electric transmission and natural gas flows; and petroleum product stocks. Sources for the dashboard include both EIA and third-party data. Key series from third-party sources include actual and forecast temperatures from the National Oceanic and Atmospheric Administration (NOAA); various electric price, load, generation, interchange, operating statistics, and fuel mix information from the Independent System Operator New England (ISO-NE); natural gas demand, LNG imports, and natural gas pipeline flows from OPIS PointLogic; crude oil and petroleum product prices from Refinitiv; and spot natural gas and electricity prices from S&P Global Market Intelligence. The commentary section will provide analysis of recent New England energy market conditions when a situation warrants more insight.